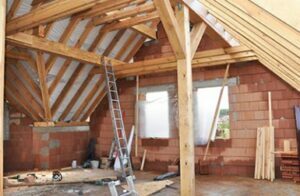 Like any business involving larger amounts of cash, home remodeling is plagued with con artists, scammers, and swindlers ready to take advantage of homeowner’s unfamiliarity with remodeling. Cedar Square homes is here with 3 of the most prevalent remodeling scams that Maryland homeowners should be on the lookout for. This remodeling scam typically begins with a knock at the door followed by a vaguely constructiony-looking person telling you that they’ve been doing work on a neighbor’s roof (They won’t specify which neighbor), and they need to get rid of the extra before heading back to work or they’ll get fired. And wouldn’t you know it, they just spotted a potentially leaky spot on your roof, which they can fix for a low, low price (paid in cash or personal check). This Maryland remodeling scam doesn’t have to involve shingles. Siding, paving, gravel are all commonly used. You’ll be lucky if they actually install what they claim to, but even if they do it’s guaranteed to be done incredibly poorly, just well enough to look decent from the ground, so they can grab their payment and run. This remodeling scam features an individual offering to restore your driveway to “fresh-poured blackness” in only one day for the low price of $1200. Upon questioning, they will quickly drop the price to $800, then $600 dollars. What an amazing deal! The trick is that you’re not paying for the service you think you are. The scammer is actually just applying a layer of a watery substance called driveway black, which is essentially just driveway paint, a process that costs about $50, not the actual repaving you were led to believe. A company offers free mold inspection and testing. Their friendly technician quickly discovers spores and takes them into his lab-equipped van for testing. Minutes later he emerges with a grave look on his face. The mold you’ve got is dangerous stuff, and exceeds federal minimum safety standards for airborne mold. It’s a good thing the technician’s company also offers mold removal. When it comes to remodeling your home, trust no one but the best. Cedar Square Homes has been operating for over 21 years. Certified contractor you can trust to deal fairly and provide excellent service with quality craftsmanship. Your Maryland remodeling project is important to you and we will treat it the exact same way. Customization is absolutely no problem and the materials we use are top quality. Throughout the project we will stay in touch and be available for you when you need us. You will have direct access to your project manager though the entire process. Calls are answered promptly and messages are returned within 24 hours. Improve your home with home improvements by the professionals at Cedar Square Homes. Contact us today at 410-987-9771.